Mary Anne Lloyd comes from a family of artists who experimented in different media, including architecture, fine art and art education. She originally intended to be a graphic designer, earning her BFA in Graphic Design from MECA, and worked at Lightspeed and Corey McPherson Nash, two studios in Boston, but began to notice a tendency to draw all her design projects. 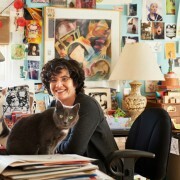 In 1988, she moved back to Portland and started her illustration career. Her work has primarily involved kids, family, animals, food, and handwritten typography. She has over 25 years of illustration experience and a wide and varied client list with work that ranges from editorial to advertising campaigns to branding. ● Clients include The Boston Globe, Chicago Tribune, Cousteau Kids, Cranium, Fish and Bone, Galison Publishing, Golden Books, Hannaford, Hasbro Toys, Kennebunk Animal Refuge League, Klutz Press, Krispy Kreme Doughnuts, Little Brown and Company, Nat Geo Kids, New York Public Library, New York Times, Nick Jr. Magazine, Nickelodeon Cable Television, Rosemont Market and Bakery, Saatchi and Saatchi, and Scholastic, among others. Hiking is one of Mary Anne’s favorite pastimes, especially since she lives a drive away from the White Mountains, some of the most beautiful mountains on the east coast. She has traveled to Italy seven times. She has a passion for good food, is deeply concerned about climate change and protecting the environment, and her two favorite people are her husband and daughter.